Show homes are a double-edged sword. A gateway to prospective sales for the builder if you get the layout & decor right, but doomed-on-first sight if you get them wrong. 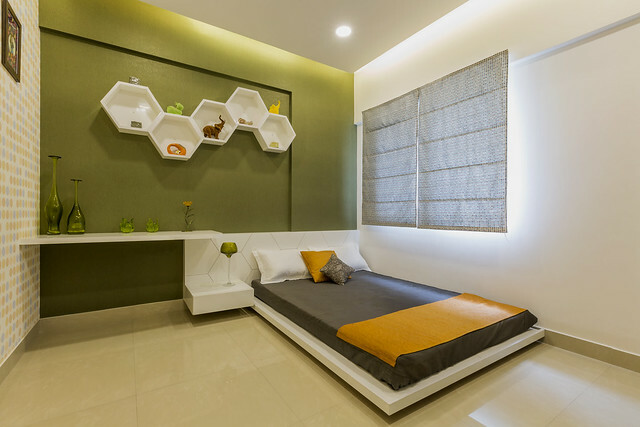 Get the interiors done tastefully in a practical layout, and you will have home buyers knocking on your doors. 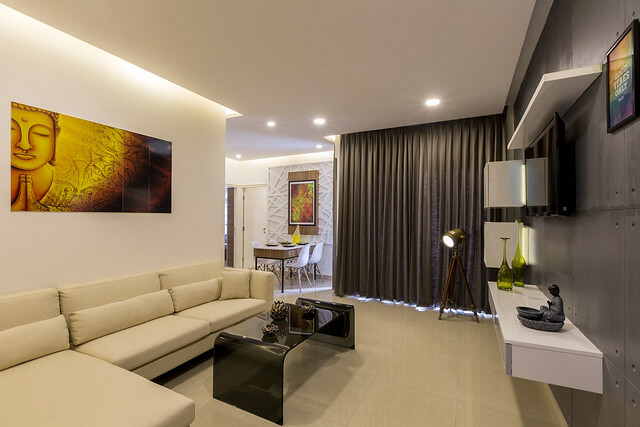 Design Cafe has nailed the brief when designing this 2-BHK model apartment in Salarpuria Sattva Laurel Heights, Bangalore. Show homes are like love at first sight. You either like a home or you don’t. To be honest, we decided to buy the house we live in now after falling in love with the model house; it was barely furnished with selective artworks peppered around the house at strategic points. We were sold on the space as we could visualize us having dinners at the table overlooking the garden, lazing on the couches, and making it our home with our furniture; and that’s what you want to see in a model house. How your family makes it home in the future. Until recently, one of my favorite monthly activities was to tour new homes; it gave an insight into upcoming localities, projects, prices, and decor trends. 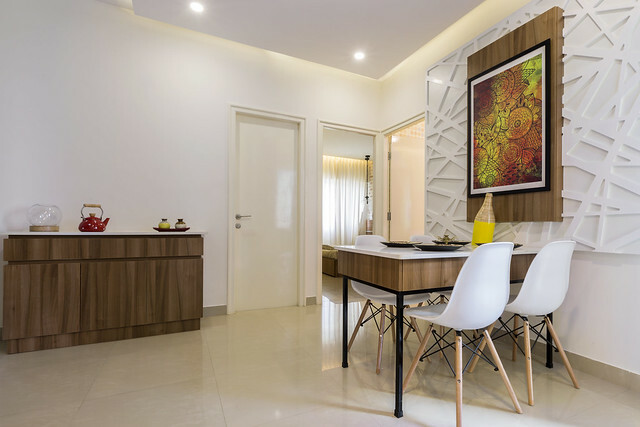 Unless you share this off-beat hobby or start your day by devouring home tours on Apartment Therapy, show homes will be your first window into the world of interiors; your tryst with decor and ideas to do up your new home. Grey is anything but gloomy; this neutral color is ruling the decor world now for it provides the perfect canvas for just about anything. The material used here is bison board with textured paint. The checkered boxes give it a luxurious look while serving as a beautiful contrast to the beige wallpaper on the adjacent wall. 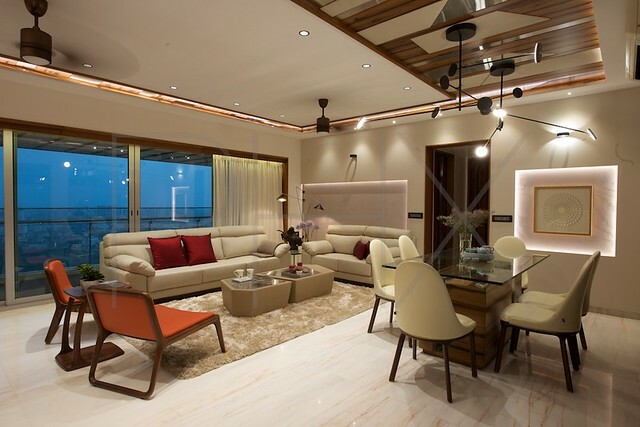 A space-saving L shaped sofa in beige is paired with glass center table. As simple as it may seem, there’s a brilliant color play in action in this confined space. 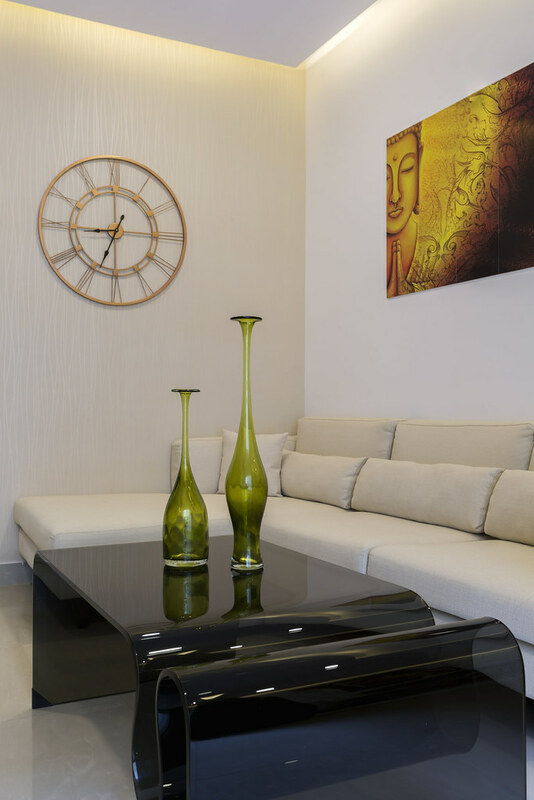 The bright yellow art work behind the sofa adds that pop of color, while the muted walls are happy to play along. The color scheme continues into the dining. One cardinal rule of the game is not to introduce too many colors for a cohesive look. Dining reinforces the grey and beige look for furniture and furnishings. You can see only one sideboard here. The storage needs of every family are personal. 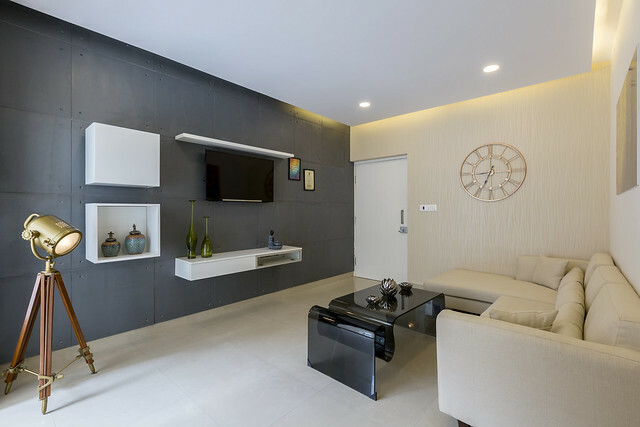 By leaving the space open, you are letting them imagine what can be a better fit for when they make it their home: a pooja, a bar cabinet, or just a credenza! 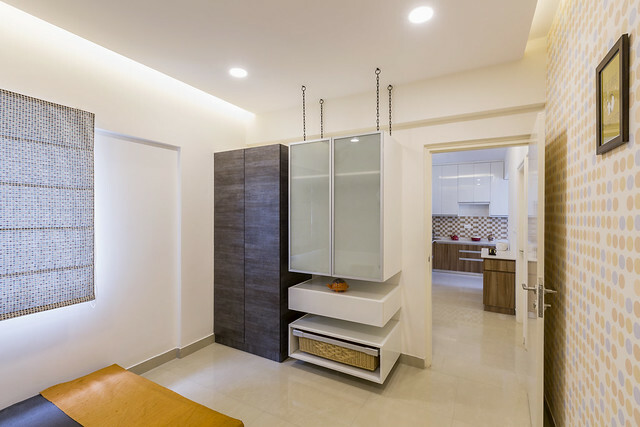 It is indeed amazing how much fits into this L-shaped kitchen from a tall pantry unit to a dedicated built-in space for appliances and enough over-head storage. 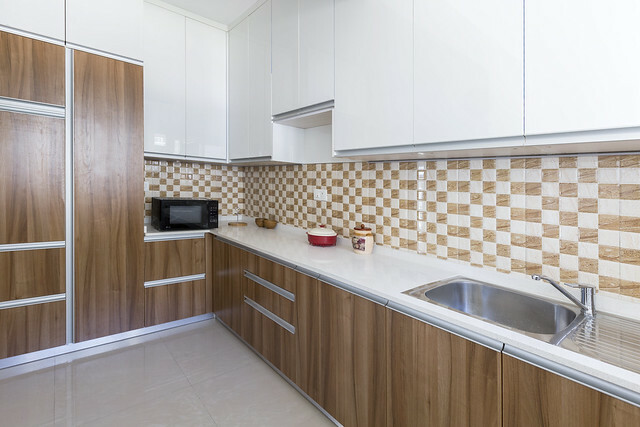 Thanks to the clever choice of white overhead cabinets, the kitchen looks bright and well lit – a factor most women love. The oak texture for the bottom cabinets makes the space look larger as compared to darker stains. You see them everywhere in different avatars from exposed and distressed to wallpapers in bright red and white. They adorn the wall of cafes and living rooms alike, and yet, we never tire of them. Real bricks in distressed finish are used as a cladding in the wall here to give it a more realistic rustic look. The sliding wardrobes sport a combination of textured walnut laminate and white lacquered glass. Sliding doors are a great solution as you don’t need the clearance area after leaving the doors open. 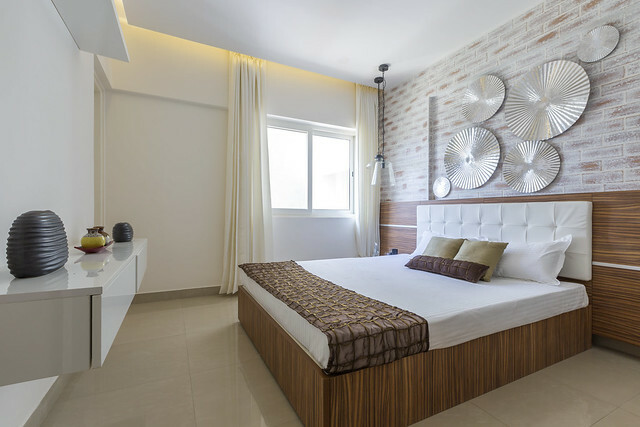 Though the bed is simple in design, the leather headboard gives it a royal look complementing the overall color scheme. This kids room breaks stereotypes of pinks and blues, and cartoon characters crawling over walls. The chains linking the storage cabinet to the ceiling give it an illusion of being suspended. The mix of open and closed shelves break the line of sight and makes it more functional for usage. The highlight of this room, however, is the chalkboard finish shutter for the wardrobe that kids can scribble upon. Remember, what I told you about decor trends at the beginning of the post? Now, this is a brilliant solution that you do not come across everyday. What you see everywhere are lacquered glass boards or chalkboards for writing. 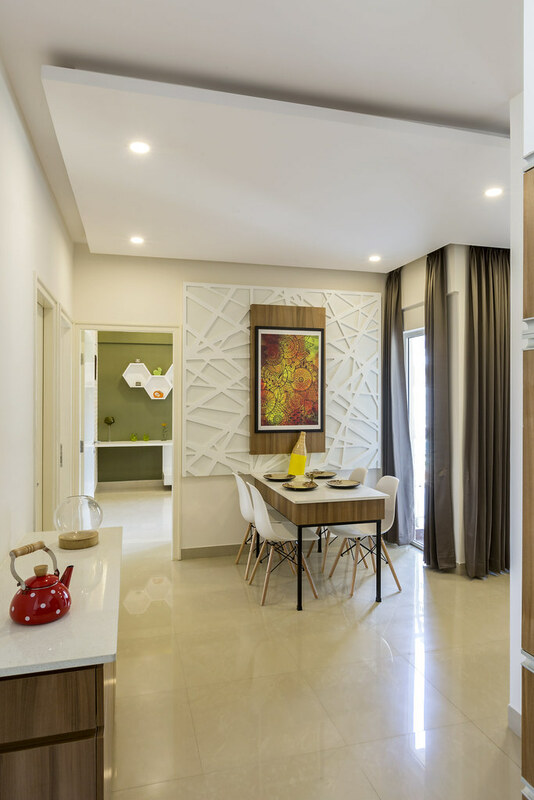 A good show home celebrates its strong points while camouflaging the weak ones. How do you think Design Cafe fared with this one? Did you discover any interesting ideas that you can’t wait to steal?